so if you could confirm or deny, it’d be much appreciated." to trek to Reading consistently. Chris is very devoted ;-)"
Kate has repeatedly said that she is not pulling the kids off TV because the hoards of paparazzi would not go away. She constantly complains that she is hounded by these evil people. She even did a dance to Lady Gaga's Paparazzi on DWTS. When just one man is hanging around, that really is hard to believe. The woman is certifiably nuts!!!!! Exaggeration, thy name is Kate Gosselin. masses of paparazzi in the trees and lurking in the parking lots. fidosmommy, exactly. At the airport getting food, "Hurry up, Mady. We're holding up the world." ...Loser. Chris is the only one who's been there for a long time, but even when there were more of them like last summer when Jon was at the height of his bad behavior, it was rarely hoards of them. Ten at the most, and that was very rarely. More often it was about four to six at the property, plus maybe a couple of fans here and there. But for a long time it's only been Chris, and Kate certainly does not need her "bodyguard." 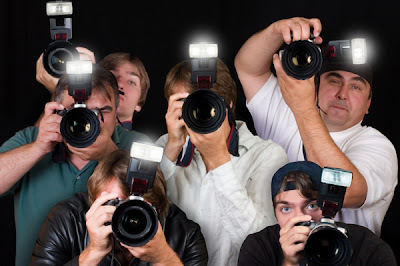 It's amazing the amount of "traction" one paparazzi and one talentless shrew can get from a few photographs. I wonder if Chris feels special knowing they planted those trees to keep just him from taking pictures. LOL Also it would be great if someone asked INF/Chris at what point would he stop hanging out to get photos of Jon and Kate. In other words, would he still be following them for the money shots if Kate and/or the kids no longer had a show? So glad to know Kate doesn't need her "bodyguard". Maybe now he can go home to his wife and sons. It must kill them to see their dad with another woman, playing Dad to her kids. But as long as Kate's happy, right? Those boys are just two more of Kate's endless list of victims. August 19, 2010, 8:41 pm Chris is actually a very nice guy – if you had to have a paparazzo following you around, he’d be the guy to choose. Kate once got lost looking for Whole Foods (I assume one she hadn’t gone to before), and she pulled over and asked Chris where it was. She followed him there, he waited, then he led her back to the interstate. BUT, I know for an absolute fact that he’s not on her speed dial or anything close. Kate's logic is astounding. Them being on TV is the reason the paps are there so they might as well keep filming? It's like flooding your bathroom but leaving the bath running because the water's still going to be on the floor. From watching the show it's no surprise that she exaggerated the number of paps. The only surprise is that there are still people who believe the crap she spews even with evidence showing otherwise. IATK said...Also it would be great if someone asked INF/Chris at what point would he stop hanging out to get photos of Jon and Kate. It would also be great if that same someone who asks Chris asked all the Kate bloggers at what point they will stop blogging. At least Chris can say he's making money off her. That's easy, when these kids are no longer exploited. Just A Thought, I'm not sure what point you're trying to make since it's obvious no one can possibly talk to all Kate bloggers. Like eating another double cheeseburger because you already had two. Like doing another shot because you already had five. Like not giving up smoking because you've already smoked for five years. Like not vacuumed because you already haven't vacuumed in a few weeks. Kate logic. Like putting your kids back on TV because you already did it for their entire lives. My point about asking Chris when he would stop following Kate is because she has always insisted that even if they stopped filming the paparazzi would continue to hound them. I don't think that's true at all and was curious what Chris would say because he IS the paparazzi. Dani, I take it you mean do I make money from TLC. Everyone with an alternate opinion has to be a lacky for TLC? LOL No, I don't work for TLC or Kate or in any other capacity remotely related to her, television or gossip rags. I can't stand her. I'm just of the opinion that if everyone had moved on when Jon and Kate split, she'd not be collecting that fat $250,000 check and her kids wouldn't have been dragged all over the country this summer. She be done, really done. Actually, when you think about it, Kate's Paparazzi dance was accurate, because there was only one taking photos of her (Tony) lol. Hahahahahahaha....just what we've all speculated all along...yet another "rumor" proven to be true. And Chris doesn't have to worry about the trees that were planted - it's clear from many of the photos he gets that he's regularly allowed on the property to get closer shots. I didn't mean you worked for TLC. You are reading here. We are reading here. You are commenting. We are commenting. So I assume your blogging and reading here is making you money or else you'd be taking your own advice. As long as you continue to read and comment, you are as guilty as anybody on this blog. So if Kate knows she has only 1 paparazzi following her then why did she go to all that trouble and expense of planting the trees on her property? I would have just insisted the kids play in another area. Is Kate trying to convince others that she is a victim of the paparazzi? Remember the 5th birthday party when Kate was disgustedly pointing toward the tree line? There were maybe 5 paparazzi in the background with their cameras, and yes, some were on a tree covered hill and I think one was in a tree. The flashes, the flashes! Only problem is these good cameras the paparazzi use don't flash. The flash would not even have a purpose in the daytime and at that distance. It was ridiculous. The verdict at the time was that TLC added the flashes for the effect they wanted of poor Kate, hounded and harassed by these monster paparazzi. The only pics Chris can take of her are when she's all made up and strutting through the parking lots. Kate is >in control< now of the pics taken of her and no "surprise shots" taken at the compound. If these are her "daytime" shopping outfits what in Gods name would she wear at night? OH PLEASE DON'T SHOW US. I'm sorry to get a bit off topic BUT can you believe another family is doing the TLC multiple reality thing? "So if Kate knows she has only 1 paparazzi following her then why did she go to all that trouble and expense of planting the trees on her property?" Perhaps she believes that there are "fans" and drive-bys who slow down, gawk, stand at the fence, etc. Weren't there reports on various blogs that when they first moved there, obsessive fans made it their vacation destination? Of course, now that the fans have dwindled in number, perhaps she's convinced herself that they are still out there and stalking her. It's really kind of sad, though, isn't it? She laments about all of the paps, says that they find her no matter where she goes, when, in reality, it's only one local, devoted photographer. It reminds me of an aging movie star who was famous in Hollywood decades and decades ago, who puts on thick pancake makeup and lipstick, and dresses to the hilt because she thinks she's still living in the golden age of Hollywood when she was young and adored by all. I wonder... Since Chris is the only pap taking pictures right now, that means every tabloid/magazine out there is using his shots, or rather INF's shots, since they own his work, I would assume. So essentially Chris and INF are the ones keeping the Gosselins in the news. What would happen if Chris stopped taking pictures/filming video? No pics, no stories. No stories, no interest. No interest, no show. What can people do to make it worth his while to not film? Kate planted the trees because she wants Steve to live with her and he refuses to do anything that might botch the image/show/income stream. He is the one calling the shots at the moment. He keeps reminding her of what she has to do to maintain her fame. She and Jon both are followers and not leaders. That is why TLC picked them, they will do anything asked and think it was their own idea. Here Kate, go fly this kite. Here's a wild guess...pay him. Don't know what the going rate is for these hourly Lot Lizard photos, but I would assume he's making some pretty beau coup bucks. Especially on the 'exclusives'. I wonder if TLC made Chris sign some kind of 'confidentiality agreement'. He could probably supplement his income with a good, explosive article (or book?) on the behind the shots behavior of Kate and Jon. Don't get me started on the flashes supposedly going off in their faces in broad daylight! How about the sound effects TLC uses? Those supposed flashes sounded like those ones from the thirties where the flash would literally explode. So phony. They use sound effects all the time to add drama. Even Kate cleaning out her garage, every time something would land on the floor, they'd add a loud THUD for effect. Even a sleeping bag, TLC? What a load! And no, I don't watch the show, I never will, I don't even see their commercials anymore, but I've seen short clips on youtube, long after it would count for anything. I guess I'm a glutton for punishment, because even a few short clips break my heart. But to give TLC or Kate a viewer to count? It's never gonna happen. I never saw the episode of the alligator hissing at Kate, but I'm willing to bet TLC doctored it up for drama. The show is as phony as it's *star*. Excuse me while I throw up a little. OT, but last night I was watching something on TV (not TLC). There was a promo for the next Duggar's epi. Over half (12 ?) of the kids had chicken pox at the same time. Can you imagine if this happened at the orphanage? Kate couldn't even take care of one kid with stomach flu, how would she take care of the litter having chicken pox? Same thing with K8 and one of her shopping trips to Target last year. K8 was supposedly hounded by the "hoards" of paps who were running around her like maniacs, flashbulbs going off like crazy. Hahaha!!! I needed that laugh this morning! Thanks Admin, for posting this. Kate is delusional. I can remember specific instances like the ones you describe. 4th of July episode (Red, White and Gosselin) Kate asks something like "Why are there 900 people standing in one square area?" When she took the kids to the park alone (Farm to Table) she stated that she WOULD normally play with the kids, but it was 900 million degrees outside, hence she could not. Naturally, I'm paraphrasing the above, but it's no secret Kate exaggerates a LOT. OzNTM said... Actually, when you think about it, Kate's Paparazzi dance was accurate, because there was only one taking photos of her (Tony) lol. HAHAHAHA, you are so right! ..."When she took the kids to the park alone (Farm to Table) she stated that she WOULD normally play with the kids, but it was 900 million degrees outside, hence she could not." ...Interesting that she had no problem taking them to New York during the "record-breaking summer heat", as stated by TLC in its promo for the upcoming New York episode. I believe the new show is probably going to slowly ease out Kateplus8. Lets face it, Kateplus8 has maxed out its time limit. People are tired of uppity Kate and the kids are not holding interest any longer. If I want to watch kids shenanigans, I'll just watch my own kids. Pretty much, Kate's public circus ongoings are keeping her alive. She is about done and knows it.